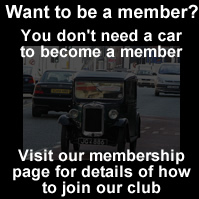 The Austin Seven was introduced to a sceptical public in 1922, the first proper large car 'in miniature' as opposed to the crude and unreliable cyclecars then available. It was not only a real car it was made out of the first class materials and steels used in large Austins. By 1939, some 290,000 Sevens were in service throughout the world, together with 20,000 Big Sevens. The design was licensed to other manufacturers and was produced in France as the Rosengart, in Germany as the Dixi, which became B.M.W's first car, and in the USA as the American Austin later the Bantam. In all of its forms, the immortal Seven provided tramfare motoring for the new generation of car owning public the world over, often operating in the most arduous of conditions imaginable. Sports and racing versions successfully competed against larger and more costly machinery both on the track and in off road trials. After years of untiring service however, many Sevens succumbed to the rigours of the 'ten year test' of the early sixties, but around 10,000 cars have survived worldwide and remain as a significant sector in todays interest in preserved transport. This tough little car continues to give amazing service and enjoyment to yet another generation, whether for simple touring trips or just pottering about on a summers day. Sir Herbert Austin, later Lord Austin, was responsible for the original design of the Seven. 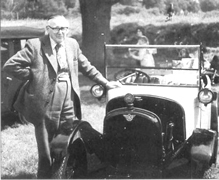 The detailed design and calculations were done to a large extent by Stanley Edge (pictured) who in later years recounted fond memories of his time at the 'Austin' at Longbridge.